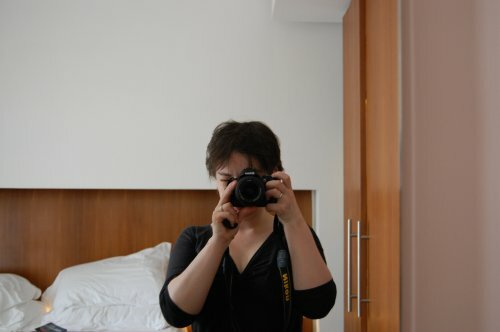 I decided to start this online adventure when I moved to Ireland in June 2007, after living in Scotland for 13 years (and before that, in Yorkshire). One of the things I’ve always talked about endlessly with friends and family is food – a blog seemed like a good way to continue doing this, stay in touch with much-missed friends and show Mum that I’m still eating properly. Although I’m not vegetarian, I find myself wanting to eat meat less and less as time goes on, so the main focus of any savoury recipes appearing here will usually be veggie or pescetarian. Who knows, maybe one day I’ll wake up craving steak tartare for breakfast, lunch and dinner – but at the moment that seems a little unlikely. Besides, making veggies the focus of any meal is surely one of the easiest ways to reach that 5-a-day target we’re all supposed to be aiming for. Of course, I then go and ruin all that good healthy work by being madly in love with cake, muffins, pies, sweets and all manner of baked goods. So butter, sugar and flour feature heavily on this site too. There’s got to be a bit of balance in life, right? ‘Little bird’ is an amalgamation of various nicknames I’ve had over the years (most of them pleasant) – things like ‘Little Jen’, ‘Wee Jen’ (guess how tall I am and I’ll send you a prize), ‘Jenny Wren’… So ‘little bird’ seemed sort of appropriate and, to be honest, I couldn’t think of any other names at the time! 4 feet 8 inches tall? What did I win? You have to mail it to the States ’cause I know I’m right. I’m always right!! Wow. Someone actually tried to guess! Id like to issue an invitation to you to visit Flahavans oat mill as part of National porridge week. If you are interested please email me for more details. Seems like this blog has been stopped for a while, but wanted to comment as I have just found you while looking crazily for the Jamie Oliver recipe for Tray baked Meringue with choc sauce etc ( OMG how good does that look) I have only just seen that episode of the series and knew I had to have it ….NOW! So I now intend to spend several days exploring your blog archives for a fresh trip to baking heaven. I happened upon your site a earlier in the year and have been meaning to create the tasty looking Fig and Hazelnut cake that adorns one the pages. I am resident in sunny Andalucia, Spain , where as you know figs are abundant and in many cases free if one knows where to look. Being a freelance wildlife photographer who spends far too much time in the valleys and mountains that surround me, I have come to know the locations of numerous “free trees” as I like to call them dotted all over the place. Figs, olives, mangos, peaches, pears among others. So with some of the figs starting to get fat on the trees I remembered your site and thought to offer you my thanks for the recipe post. Lovely blog! Do you have an email address I could send something to?! Hello Jen, your blog is fantastic. I am currently working for Northern Ireland Black Taxi Tours and wonder whether you would be interested in taking a free tour around Belfast? Contact if interested.